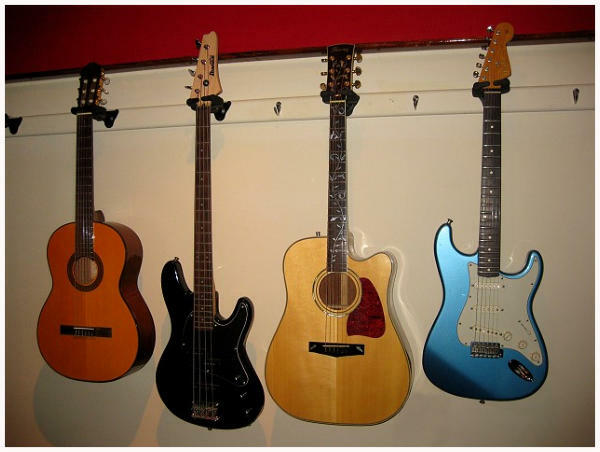 Guitars From left, Takamine Classical, Ibanez Roadster Bass, Ibanez Artwood Acoustic and Fender Stratocaster. Pedalboard 1 This is the larger board for local gigs and recording. The Boss amp switcher is used to switch between the amp and the talkbox. Talkbox The talkbox was constructed from a small 10 watt solid state practice amp with the output fed into a horn driver. Pedalboard 2 This is the smaller board designed for travelling purposes. It was built to be as small and compact as possible. Gibson Les Paul Standard Gibson Les Paul Studio Tokai Love Rock Goldtop Tokai Love Rock Sunburst Flametop Fender Stratocaster Ibanez Artwood Acoustic Takamine Nylon String Classical Ibanez Roadster 4 String Bass Amps: Marshall TSL602 Combo Marshall MG100HFX (Head and Cab) Marshall MG100FX Combo Pedalboards: 2 pedalboards (smaller compact model for air travel and a larger model for local gigs). The boards consist of MI Audio (for distortion), Boss and Samson products. 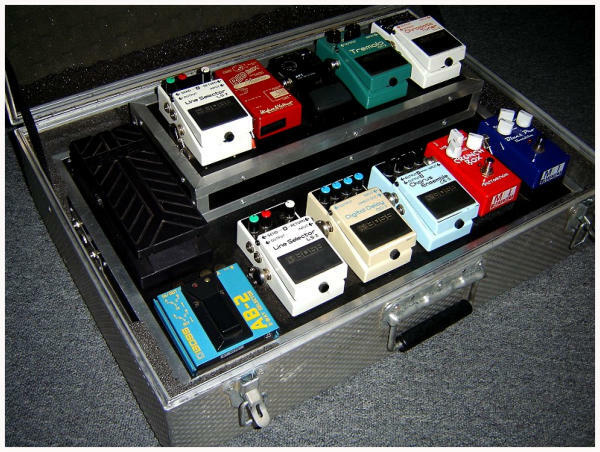 He also uses a “home made” talk box at various gigs. Peter has always miced up his amps for recording and live performances but in the past few years has resorted to “going direct” for his live rig. The guitar tone therefore is pretty much set up before reaching the sound desk. 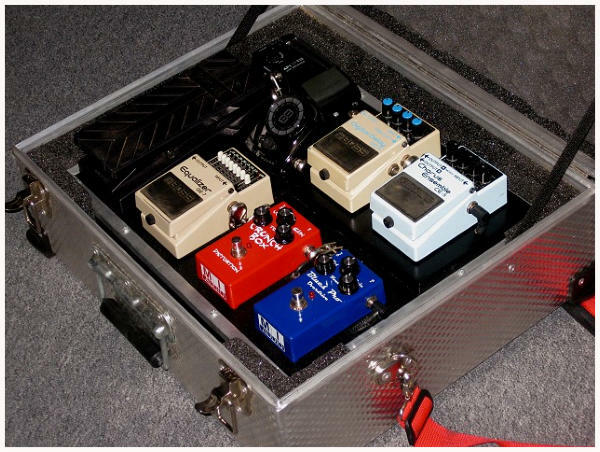 Both boards are fed into DI Boxes (Hughes and Kettner Red Box) and then sent via a balanced feed to the desk. This has been done in order to achieve a more consistent guitar tone from one venue to the next. The on stage amp therefore has become his monitor and nothing else. He has also been using a radio transmitter for the past 7 years (Samson Airline System). Peter has been playing Gibson Les Pauls for more than 25 years but in 2010 aquired two Tokai Love Rock guitars. 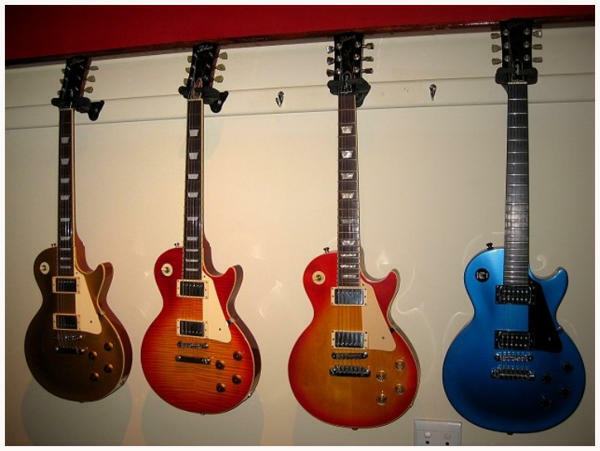 They are Japanese hand made “Les Paul” replicas. They are completely standard in every way and have not had any modifications done to them whatsoever. Guitars From left, Tokai Love Rock Goldtop, Tokai Love Rock Flametop, Gibson Les Paul Standard, Gibson Les Paul Studio. PETER HANMER TEAMS UP WITH MI AUDIO (July 2013) Shortly after “Blues Parade” (a track from Living for the Moment) was uploaded on YouTube earlier this month, Peter was approached by Dave Reynolds, head of Sales and Distribution to become an official Artist Liaison for MI Audio. This is what Dave had to say “Peter.... great production, great playing and a great track, that damn hook has been stuck in my head all day. 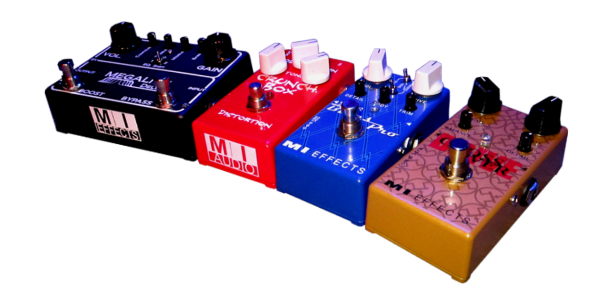 Such tasty tones!” Peter Hanmer is now an official Artist Liaison for MI Audio!!!! This is an exciting development for Peter and his music as MI Audio has played a massive role in his personal guitar setup. Peter has been using MI Audio products in his studio (Foxglove Studios) as well as for live performances for the past 5 years. Both his solo albums were recorded using the MI Audio Crunch Box and MI Audio Blues Pro pedals exclusively. His music will receive international expose via their website as well as via facebook. “We too are excited about having you on board Peter. It’s always great to have an artist as part of our team that is a fan of the gear we make and can’t wait to hear your thoughts on the new super crunch box and super blues pro!” Christian Moraga, MI Audio Production.